Our team member and Lynbrook team leader, Susan is helping residents realize just how much plastic bag pollution each person creates in a year. 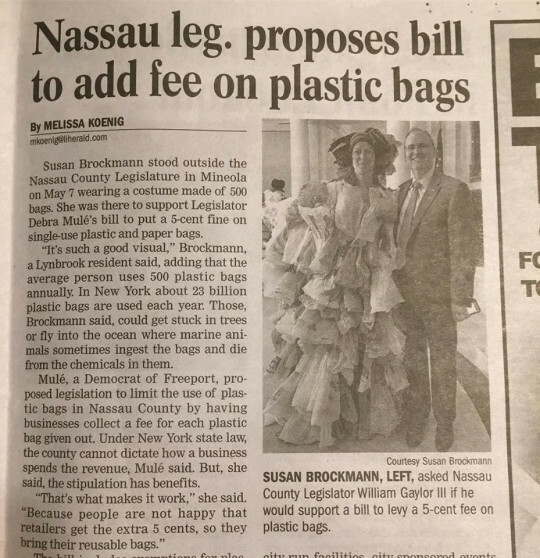 There’s a Nassau proposal to deal with that waste but it’s not even being allowed to be discussed. Does your County Legislator know how YOU feel about it? If not, you need to tell them it’s time to eliminate needless single use checkout bag pollution. It’s easy- just Bring Your Own Bag Nassau. In response, all editions of the LI Herald ran an editorial this week in favor of action on checkout bag pollution! Click that link to read it.